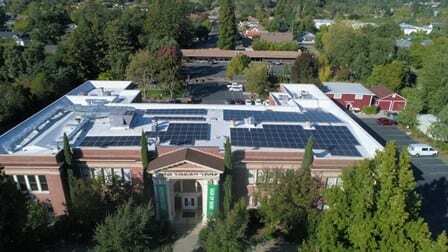 Novato and Sonoma based SolarCraft, a leading North Bay solar installer for over 35 years, recently completed the installation of a 111 kW DC solar system at New Life Christian Center in Novato, CA. The system is designed to offset close to 93% of their annual utility bills for the church and school facilities. New Life is reducing their operating costs by thousands every month and stabilizing energy expenses for decades to come. The solar power system is roof mounted for maximum southern sun exposure and consists of 309 high-efficiency solar panels, producing 155,996 kWh annually. Excess power generated during the day is banked by PG&E for credit towards future use. “It was great working with a local company that was flexible to our facility demands as both a church and school. SolarCraft had exceptional staff that was a pleasure to work with throughout all phases of installation” added Christopher Mychajluk, Head of School. During the life of the system, over 6 million pounds of carbon dioxide generated by New Life Christian Center’s operations will be eliminated. This impact is equivalent to removing air pollution produced by nearly 10 million miles of driving over 25 years or the pollutants removed by 53 acres of trees in one year. New Life Christian Center facility is shared by New Life Church and Marin Christian Academy, located in Novato, CA. New Life Church is multi-ethnic, multi-generational congregation that was founded in Novato in 1957. They are passionate about reaching the North Bay with the love of Jesus Christ. The church is associated with the Assemblies of God (AG). Marin Christian Academy is an accredited, independent, faith-centered school for students in preschool through 12th grade. Throughout the school’s 40-year history, MCA has remained dedicated to educational excellence in a nurturing and biblical environment.